This guide is written to help identify horse colors. It does not explain the genetics behind the colors. If you would like to know more about the genetics of these colors please visit Dilutions in horses. If you would like to view more examples of Silver horses please visit the Silver Gallery. Silver in horses affects areas that would otherwise be black, changing the color from black to gray or brown. It has it’s greatest effect on a horse’s mane and tail. In horses that are heavily affected the mane and tail can be almost completely white or silver. If the horse also has feathers (the hairs on the horse's pastern), the feathers will be affected to the same extent as the mane and tail. Because silver only affects black pigment, Chestnut horses and the red body of Silver Bays will not be changed. Silver is associated with eye problems. Although the vast majority of silver horses are not affected, it is best to be aware of the association so that proper vet checks can be conducted before purchase. Silver is sometimes referred to as Silver Dapple because it often (but not always) is present with heavy dappling. Other terms used in association with silver are Chocolate and Taffy. The use of the term Chocolate is the most common among Gaited breeds in the Eastern United States while Taffy is often used in Australia. Silver brown horses will be similar to silver bay but darker with more brown or gray coloration on the body. Some of the darkest may look Silver Black but have reddish noses and flanks. A silver black will be a fairly uniform gray or brown with a mane and tail that can vary from a bleached appearance to completely silver or white. Some silver blacks go through amazing color changes. 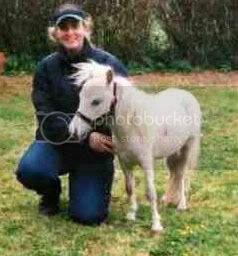 Some will be so extreme as to look palomino in their faded foal coats only to shed off a more normal silver black color. To see more on this color change visit Silver Fox Album. Silver Chestnut is not technically a color as silver does not modify chestnut. It is used rather to designate a chestnut horse who also carries the silver gene. It is interesting to note that when gray and silver are both present the affected horse will gray very rapidly. They are often completely white by the time they are yearlings and their have been reports of grays with silver being born completely white (as caused by gray not a white pattern). Chywoon Rusty's Applause 28" AMHA stallion, Silver Black Tobiano with gray as a yearling. An example of how fast a silver with gray will gray.